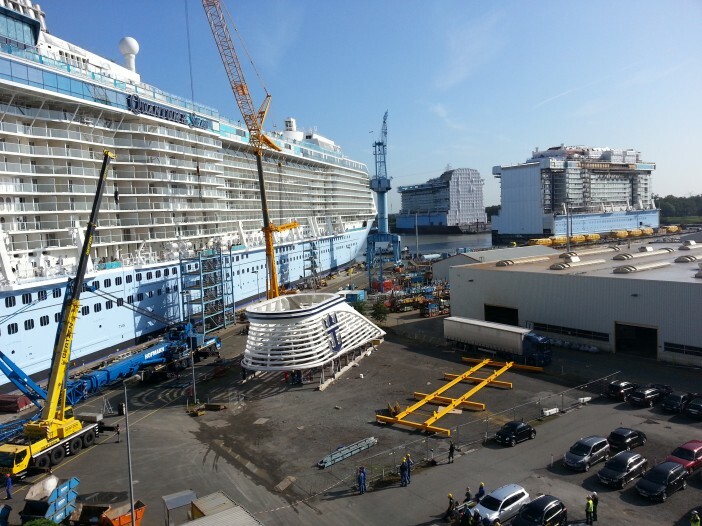 The excitement surrounding the first ship from the upcoming Royal Caribbean Quantum Class, Quantum of the Seas, is reaching a boiling point this week as the liner emerged from its dry dock in North-Western Germany for the first time. The Quantum of the Seas will be the third largest ship in the world when it first takes to the seas in November this year. The ship will be joined by her identical sister, Anthem of the Seas just a few months later in spring 2015. The 4,180 passenger ship will travel from its dry dock to Southampton where it will make its inaugural trip to New York. In June 2015, the Quantum of the Seas will reposition again, this time to the southern hemisphere, hosting cruises mostly around the Asia seas. The ship will be the largest liner cruising the Southern Hemisphere, with the two larger liners (Oasis of the Seas and the Allure of Seas) currently calling Florida home. Many world firsts will be present on the 18 deck Quantum of the Seas, including the North Star, an observation pod which transports passengers 300ft into the air, offering them incredible seascapes and views of distant shores. The ship will also host the RipCord iFly, the first skydiving simulator on the seas. Focussing intently on the family market, the Quantum of the Seas incorporates an activity centre called the SeaPlex, designed to keep kids entertained and give parents a little respite. With bumper cars, flying trapezes, basketball courts and a food truck, the SeaPlex will be the largest activity centre on the seas. Locals and cruise-fanatics came out to see the brand new ship emerge from the Meyer Werft shipyard for the first time, taking advantage of the awe-inspiring photo opportunity. Engineers will be brought in to make another round of double-checks before the liner makes her way to Southampton, testing the thrusters and stabilisers and applying finishing touches to both the interior and exterior. For those of you who have already enjoyed a Royal Caribbean cruise from Australia, the cabins on the new class of liners may surprise you with the ship offering the largest rooms, cabins and suites in their entire suite. The Quantum of the Seas is just one part of an exciting couple of years coming up for the Australian and Southern Hemisphere cruise industry with more ships and itineraries coming to Australia throughout the 2014/15 season than ever before. For the full range of Cruise1st deals and offers, visit our home page or call our dedicated sales staff on 1300 857 345.